Cheap designer bags are a precious commodity indeed. A Gucci tote or a Prada clutch at a price a 'regular' person can afford is a coveted item in Florence, but one which is findable. You do need some luck though. The places listed below carry exclusive label bags at lower prices but the designer names that they carry change from week to week. Needless to say, these bargain bags go like hotcakes and are often sold even before they reach the store! That makes for high turnover, so you have to be fortunate that the bag you're looking for just happens to be in the shop when you are. So let's stop chatting, you'd better get moving! 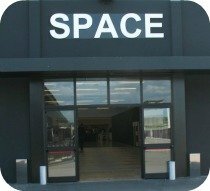 This store is not very impressive to look at - you'd probably walk right passed it without going in. And, there’s no shop sign - Oceano Moda is written on the adjoining store on the left, but the stockhouse has just a plain store front (see pic right). Inside the tiny space there are just racks with lots of designer name clothes (brands change all the time). A little known fact about this store is the designer bags. 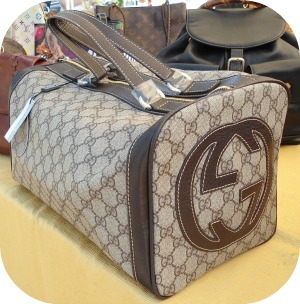 You can find some of the biggest and most popular Italian labels for nearly half of the retail market price. But you have to know about it and ask the owner to show you what they’ve got at the moment as bags are not on display in the shop window. Oceanomoda also has cheap designer clothes for men and women (brands change all the time). If you don't mind bargaining, Enzo, the owner, is not adverse to knocking a little off the asking price of the goods. Sotto Sotto is also on the cheap designer clothes page but I'm including it here again because they have quite a nice selection of Italian and foreign label designer bags. The bags are located on shelves above the clothing racks so ask the shop assistant to have a closer look or to tell you what designer labels are in stock. Prices can be up to 50% cheaper than the going retail rates. 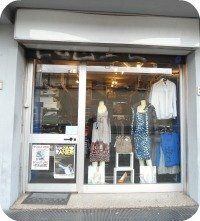 Desii is a vintage store dedicated to clothes, bags and accessories of the most prestigious fashion houses (Pucci, Gucci, Ferragamo, Louis Vitton, Prada, etc). There are many vintage items (e.g. 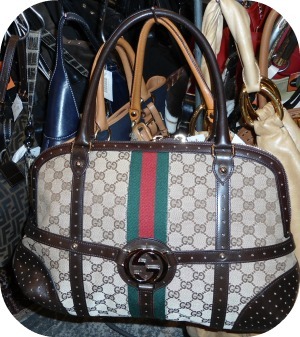 from the 70’s or 80’s) but also a large selection of designer bags that are almost new. 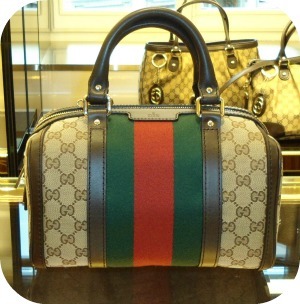 The last time I was there they had a gorgeous Gucci (pic above) that still had the label attached to it, but officially had to be classified as 'used' since it had already had one owner, yet the bag was brand new! At Desii they generally have a handful of cheap Gucci bags - the bag above would easily go for about €800 at a Gucci store but at Desii was under €400. This unique boutique specializes in second-hand and vintage designer handbags. 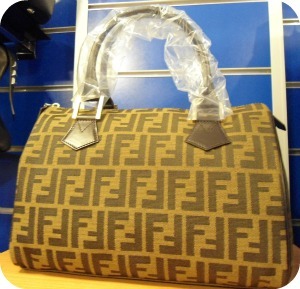 You can find bags, purses and wallets in good condition by Italian and foreign labels: Gucci, Prada, Dolce & Gabbana, Cavalli, Fendi, Alviero Martini, Chanel, Louis Vitton, Yves Saint Laurent, etc. Items go for a fraction of their original cost (from €40 up) depending on the condition and year of the model. How to get there: short taxi ride from station (5 mins) or one of several buses: no. 17 (direction ‘Boito’ or ‘Cascine’) – get no. 17 at station near escalators/pharmacy side of station. Or get any of buses no. 29 , 30, or 35 which all stop in via Alamanni on the tram side of the station. Bus stop is a block away from steps leading up to station entrance. Walk in direction of the tram rails going away from station and via Alamanni is the street on the right when the road forks. Get off the bus at ‘via Toselli’ stop (there’s a fenced-in parking lot right in front of the bus stop). From the bus stop walk back along via Toselli in the direction you came from to via Lulli (2 corners from the bus stop) and turn right – shop is 2 blocks down. Its closing coincided with the opening of the Gucci outlet at the designer shopping village called The Mall about 40 minutes south of Florence. This outlet where you can find cheap Gucci bags (remember, 'cheap' when used in a sentence with 'Gucci' still means in the hundreds...) has become a sort of Mecca for fashion lovers. It might attract more people to Florence than David himself! This out-of-town outlet sells cheap designer bags by Prada and Miu Miu from prior seasons at prices that can be up to 50% less than what pieces originally sold for. Saturday is the busiest day so expect crowds and perhaps a long wait to get in. On December 24th and 31st store may have shorter opening times – call to be sure. From Florence take the A1 highway going south (direction Arezzo/Rome). Get off at the ‘Valdarno’ exit. Go in the direction of ‘Montevarchi’ (state road 69) and pass through Montevarchi and Levanella (town where stockhouse is located). Once you have finished passing through the town of Levanella (at the end of the residential area on the right there is a gas station), take the first left (there will be signs saying ‘the Space Outlet’ Prada). 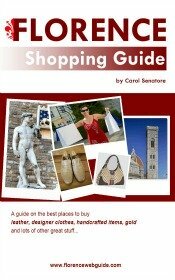 Take a train from the main Florence station, Santa Maria Novella, to Montevarchi. At the Montevarchi station get a taxi to Levanella, the Space outlet (just under 3 miles).